This book provides a state-of-the-art overview of current research on regional competition and co-operation. Developing our current understanding of the new role of regions and their behaviour, this book addresses questions such as: How and why do regions compete? How does competition between border regions operate? Which regions are successful and which regions fail? What are the implications of regional competition in terms of resource allocation, the location of economic activities and the distribution of incomes? The book illuminates a number of critical theoretical end empirical issues relating to the competitive and cooperative nature of regions, as well as highlighting a number of new case studies from a variety of countries. The book will be a useful enhancement to undergraduate and post-graduate courses in economics, economic geography, regional science, regional planning, business administration, and international and industrial management. It will also be an invaluable guidance tool for researchers, consultants and policy makers in international organizations such as the EU, the World Bank and the OECD. In recent decades, the world has witnessed the emergence of a global knowledge economy in which functional regions increasingly play a role as independent and dynamic market places. These are integrated with other functional regions by means of flows of information, knowledge, and commodities. 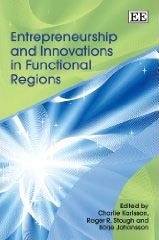 This contemporary and illuminating book provides a state-of-the-art overview of current research on innovation and entrepreneurship in functional regions. There are numerous questions regarding entrepreneurship and innovation in functional regions that have not yet been answered - until now. Some of the issues that the expert contributors in this field question are - How do firms compete and how do they develop their competitive strategies? How important are entrepreneurial actions and innovation? How important are firm size, firm maturity and corporate structure for innovation? Entrepreneurship and Innovations in Functional Regions will be an invaluable resource for students and scholars of entrepreneurship, business economics, innovation and regional science. ‘Working Bodies: Interactive Service Employment and Workplace Identities’ by Linda McDowell October 2009, Paperback, Wiley-Blackwell.